In Honour Of the Late Florence Daysh. The Officers and Members of the St. Mark’s Old Scholars’ Association have written the National Conservation Commission recommending that the Three Houses Park be renamed “The Florence Daysh Memorial Park” in honour of the late Florence Evelyn Daysh OBE (1908-1979). The Association has also forwarded its request to the Prime Minister’s Office. The Association has also sought the support of Mr. Brian Ward, one of the Directors of the Company responsible for the lands on which the Park is built. Mr. Ward has indicated that the naming of the Park after Florence Daysh was also the wish of the former owner of the property, the late Mr. L. A. Ward (former senator) and has given the Association his full support. The St. Mark’s Old Scholars’ Association was instrumental in the creation of the Three House Park. In August 1986, it was the St. Mark’s Old Scholar’s Association which made representation to the Government to have the then wooded area transformed into the Park that it is today. The Park was opened on 28th April 1990. Concerned that a woman of Florence’s Stature is virtually unknown by many Barbadians, the Association is making every effort to ensure that this Barbadian Icon takes her rightful place on the historical landscape of Barbados. In April this year the Association celebrated National Heroes’ Day by naming Florence Daysh as the unsung Hero of St. Philip for the year 2008 in recognition of her sterling contribution to the personal development of the poor people, who lived in the area and who worked on the neighbouring plantations, namely Groves, Thickets and Fortesque, and her contribution at the national level. All churches and schools in St. Philip were requested to read the biography of the late Florence Daysh at one of their services or assemblies during the period leading up to April 28, 2008. She grew up at Thicket plantation, attended the newly opened Codrington High School and furthered her education in England and France. On returning home she immersed herself in social work, with the revered Mrs. Muriel Hanschell at the Black Rock Baby Welfare League. At the start of the Second World War she joined the British Red Cross, becoming head of the department dealing with prisoners of war. Back in Barbados she married Commander Norman Daysh, a naval officer from New Zealand, and continued to dedicate her life to the women and children of Barbados. With the wife of Major Peebles, founder of the King George V Memorial Park, she started the St. Philip Baby clinic in 1948. She was the president of the Black Rock Organisation from 1950 to 1964 and introduced the first mobile programme in childcare. 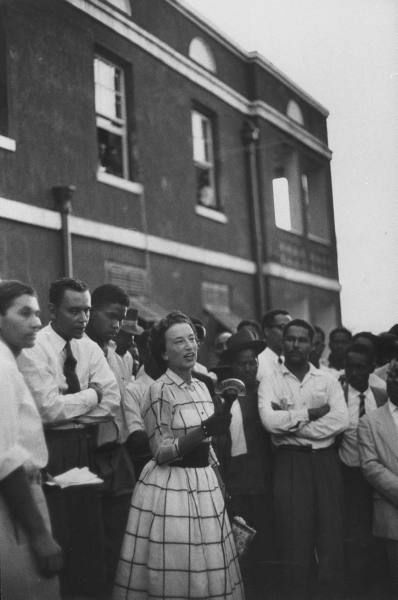 She virtually built and equipped the Joan Arundell Day Nursery and gave of her time to the YMCA, the Fontabelle Day Nursery, the Girls’ Industrial Union, Youth Town and other organisations. In 1960 she launched the Barbados Branch of the British Red Cross Society and was its first director – perhaps her most challenging task ever. She was the first president of the Barbados Council of Women and originator of many other efforts. In 1950 she was elected to the Vestry of St. Philip, and soon afterwards appointed to the Legislative Council, in each case only the second woman to be so honoured. In her maiden speech in the Council she declared “I am a coloured woman and proud of it” thus further endearing herself to the public at large. In 1958 she was the only woman nominated to contest the elections for the Federal Parliament. She won handsomely, defeating Errol Barrow, and served with distinction until the demise of the Parliament. Her life was a brilliant beacon, dedicated to the cause of the women and children of Barbados. She dominated women’s politics for two decades and was awarded the OBE, but her greatest reward was the love of the people. There have been 22 visitors (52 hits) to this page today. Updated and current.